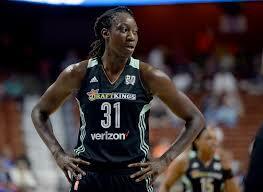 NEW YORK, July 11, 2017 – New York Liberty forward Tina Charles has been selected as a 2017 WNBA All-Star joining the list of 10 players selected by fans, WNBA players and media to start in Verizon WNBA All-Star 2017. For Charles, it is the 3rd time in her career she has been voted as a starter for the Eastern Conference, and she receives her 5th overall All-Star selection. She has had a stellar 1st half of the WNBA season, ranking 3rd in the league in scoring (20.8 ppg) and rebounding (9.1 rpg). This year, the WNBA All-Star starters were selected by fans, players, and the media. Charles finished 2nd in the WNBA fan vote for the Eastern Conference, tied for 1st in the media vote, and finished 1st in the player vote. Sue Bird of the Seattle Storm earned her 10th All-Star selection, Bird has tied Tamika Catchings for the most in WNBA history. Bird will represent the host Storm in the All-Star Game, which will take place on Saturday, July 22 at KeyArena in Seattle (3:30 p.m. ET on ABC).